Is it possible recover messages deleted in the process of iOS 8.4 updating from iTunes backup? 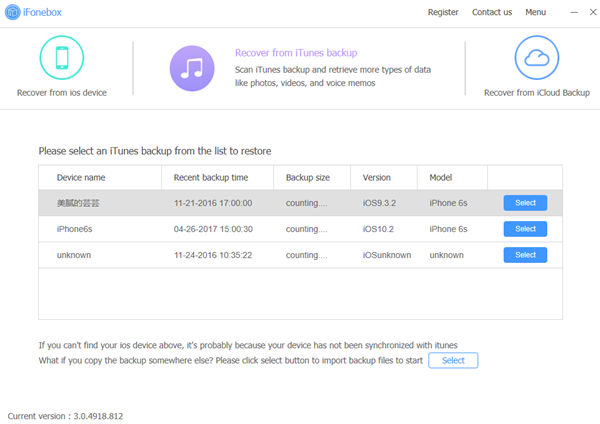 Updating to latest iOS 8.4 may cause data loss, for example messages loss, but you can recover the lost messages selectively from the iTunes backup file. If you are always excited about Apple’s new release, because it always bring shinny things to the market, you definitely will choose install the latest iOS 8.4 after it is released. Accidents, however, always hits us in a surprising way. All your messages were gone without any trace after you finished the iOS 8.4 updating. You swear you didn’t delete any messages before the iOS 8.4 updating. Long story in short, you have lost your iPhone messages in the process of iOS 8.4 updating. Well fear not. Though messages wiped out due to the iOS 8.4 updating cannot be recovered directly from your iDevice like iPhone, iPad or iPod Touch, you can recover the messages lost from iTunes backup provided that you have one. Actually, unless you have disabled the automatic sync option in iTunes, you should have created a backup every time you synced with your PC or Mac. Instead of recovering the lost messages by restoring your iPhone, iPad or iPod Touch with the entire iTunes backup file, I suggest you recover with third party iOS data recovery software which allows retrieving the messages selectively, because the former method may result in data overlaps and permanent erasing. iFonebox is such kind of software that can recover lost messages selectively from iTunes backup file. 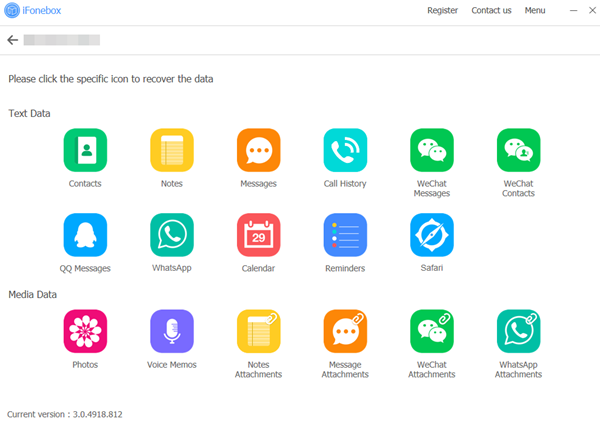 In addition, iFonebox can recover lost contacts, notes, reminders, safari bookmarks, call history and photos etc from iDevice as well as from iTunes or iCloud backup. You can download a free trial version to have a try but you need to pay for the full version with registration code. Now I am going to demonstrate you how to recover the lost messages from iTunes backup file selectively. Step 1: Install and run the full version of iFonebox, and then click to choose the recovery mode of “Recover from iTunes Backup”. You will be presented with an interface asking you to select a backup file. Click to choose the backup file from which you want export and recover lost messages. Step 2: Choose messages to recover by clicking on the icon of messages on the interface listing all the supported data types. 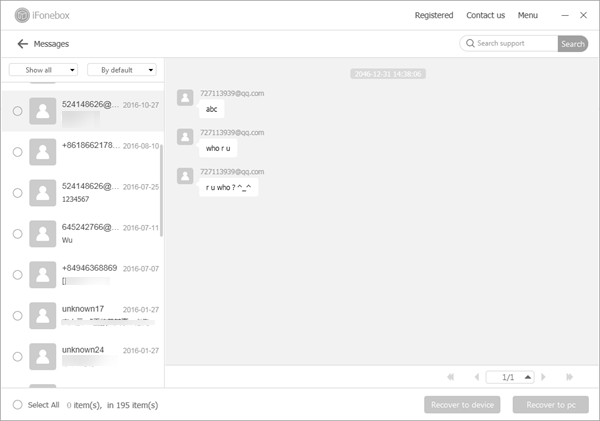 Step 3: Preview all the exported messages before recovering. You can do modifications on the exported messages. Besides, if you just want the lost items recovered, you can check “Display only deleted items” or you can check whatever you want to recover.